We discuss a lot of Market Theory in this video when analyzing the various asset classes from Gold and Bonds to Energy Markets, with considerable time spent discussing equities, divergences in investing and performance outcomes over time, along with what a crazy Central Bank Era this last decade has become, and placing this era in some sort of historical context. The entire investable universe of financial assets is reflected and exemplified in the Bitcoin Chart. This period will go down in the history of the world as the loosest financial conditions ever. Financial conditions are so expansionary that the indexes and usual measures don`t fully capture just how extraordinary we are above any other period in the history of capital markets and historical norms. The popping of this gigantic multiplier effect of a credit, debt, central bank, and asset inflation bubble will bring back a new era of 3% money management fee and 30% profit fee for the best money managers who can navigate and protect capital from the inevitable capital destruction phase of the ultimate financial market global asset crash. 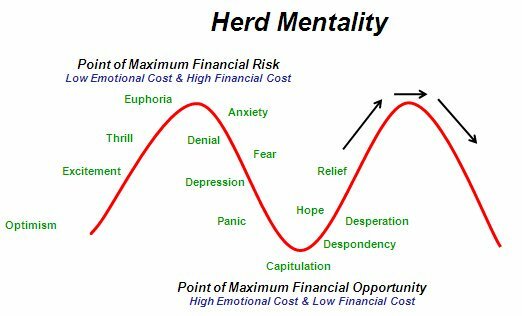 The psychology of human beings, societal behavior, the forming of herd mentality and group think clusters and how this adds to the already QE juiced Financial Market Conditions is really something to behold from a momentum standpoint. The Same momentum can be seen in stocks like Caterpillar`s Stock and the Bitcoin Market, this is asset inflation like we have never experienced. All Central Banks are so behind the curve, we are talking about 300 basis points behind the curve, (this is across the Central Bank Landscape - imagine the cumulative effect across 12 Central Banks and Centrally Planned Government Models) there is no new normal. The Credit Bubble corresponds nicely to the piss poor management style of the Central Bank Monetary System and the resultant Boom and Crash Scenarios of Financial Markets that have played out over the last 50 years, and especially the last 20 years as Central Banks have gained more influence, with the latest being their recent foray into Financial Markets and Direct Asset Purchases. There will be a Next Financial Market Crash - at this point, it is just identifying what the catalyst behind it will be, and the timing of when this occurs that is in question.